I have been nervous about this trip since I booked it, especially the last two days. But I made the choice to take this journey alone to prove to myself that I could do it. I generally have a pretty confident view on life and I am not one to walk away from a challenge. However I think this long distance solo ride is about as challenging as when Barry bought me a drag bike and asked me to race it! I don’t openly talk about my fear too much, especially since I feel obligated to show a confident strong front as a leader of a company. But what the hell, I am a woman and I was nervous! I shared my feelings when people asked about my trip and I think that this openness helped me deal with it. Ok, enough with the thoughtful BS! Lets ride! My flight left Anchorage at 7:00am this morning (May 28, 2014). I was happy to see our family friend Carol was my flight attendant and that helped soothe my nerves. She embodies kindness and was so sweet. That little comfort made my first flight a breeze. My second flight from Seattle to Tucson was also pleasant, as I was surprised to find I had a first class seat. Apparently I booked my ticket with miles that way, but I had forgotten so it was like a bonus! I was sitting next to a nice woman who had to take her cat to the pet ER that morning so her husband had to stay home and fly out later to make sure the cat was ok. Understanding her pain we bonded and chatted about our kids (aka pets). We chatted about my journey and her visit with her mom who lived in Tucson. When we landed the heat was like a furnace blasting as soon as they opened the door to the gate. My bag was one of the first unloaded so I trudged with my two bags out to a cab. The driver was an older guy with long grey hair. I immediately pegged him for a transplant from CA and I was right. 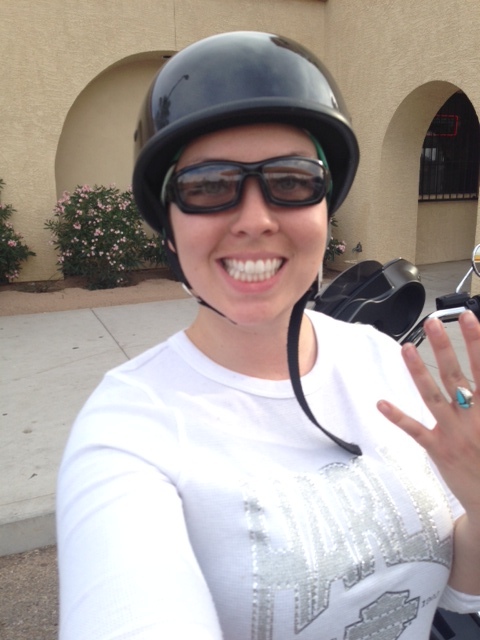 W chatted about my journey as we headed toward the Harley-Davidson of Tucson. He was a little bit of an odd character, sometimes interjecting comments that were inaudible and I was unsure if he was talking to me or the traffic. We made it to the shop in good time and I unloaded my stuff. I headed in and saw Romello, who was the service advisor who had assisted me when I dropped my bike off there. They were great to work with. They stored my bike and even washed it for me! I hung out and chatted with the staff for awhile hoping to come up with a plan and hoping the heat would subside. 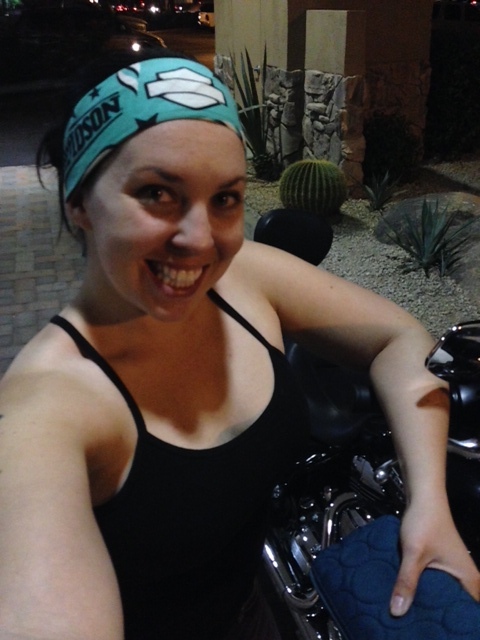 Eventually I decided I couldn’t just hang out in Tucson for the night (which was my original plan) so I loaded up my bike and started heading north. 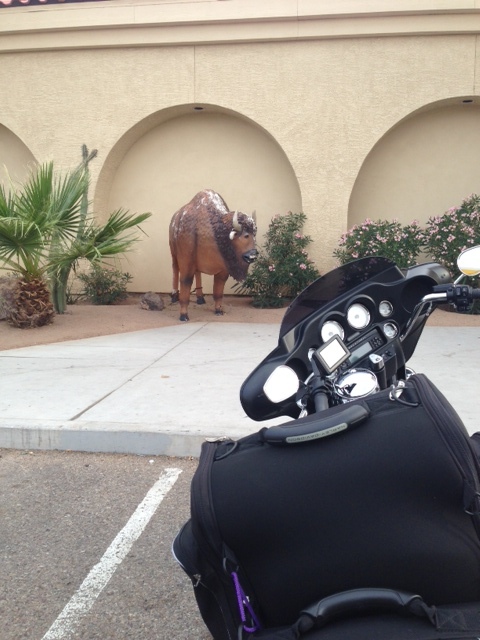 From there I decided I would keep riding to Avondale where I had googled at least had a Best Western. The town of Avondale is mostly a giant distribution center. There were all sorts of big buildings with trucks coming and going as well as some type of stinky industry that was not pleasant to ride through. I took a back road off the freeway to get to Avondale and although it was nice to get off of the freeway, there wasn’t much scenery difference. It was great to get to watch a beautiful sunset as I was getting closer to my destination. The sky had some clouds and as the sun set they turned all sorts of pink and purple. I settled on a Holiday Inn Express and was greeted by a super nice receptionist. At this point I was starving and so hot. I got checked in, she even gave me a discount and got me a room really close to the lobby so I didn’t have to lug my bags really far. Without much thought I went next door to eat at the Mexican restaurant, it was alright and I got a discount for being a hotel guest. All in all my first day was great. I am excited for tomorrow, I am riding through Prescott and Flagstaff on my way to the Grand Canyon! This entry was posted in Uncategorized and tagged adventure, alaska bikers, az, biker girls, Bikers, buffalo, harley davidson motorcycles, Harley-Davidson, harleygirls, journey, legendary, phoenix, ride, riders, road trip, travel, tuscon, women, women riders. Bookmark the permalink. You’re going to have so much fun… I’m excited and jealous at the same time. Keep up the posts so that some of us working stiffs can experience the freedom of the road through you. Safe travels, Dia. Enjoying your blog.